It's finally happening! After a few episodes of buildup we're actually doing the all-Emily episode. So let's get to it! While Emily travels on the subway, constantly glancing over her shoulder, looking for evidence of Doyle's goons, an Italian-speaking gentleman returns home, commenting on the heavy storm that's about to hit the area. There is a suspicious silence from his family when he calls upstairs to them. Equally sinister happenings are transpiring in another family's house, where a woman readying herself for a night on the town hears a thump (which silences her husband) in the other room before all the lights are killed. Soon afterwards both families are killed by men is needlessly creepy masks! Oh, and for the record, that needlessly creepy man is apparently killing a woman by suffocating her with a towel pulled taut across her face. Which is a few degrees below plausible. Emily's okay, though - as she naps on the subway, Sebastian and Cia arrive to chat with her. She lets them know that she's seen Doyle, and they're surprised - as am I. Why didn't she mention that she was going out to meet him last week? There was literally nothing stopping him from killing her. She also maintains her position that she doesn't want to tell her team about this whole situation because it's 'her fight'. So Emily's plan is try to catch an internationally wanted criminal herself, rather than using the full resources of the United States government - which, it's important to remember - are at her disposal. The only possible explanation for this behaviour is that she did something so awful (mass murder/treason) in capturing Doyle the first time that if her government found out about it she'd be sent to jail forever. Of course that's completely inconsistent with everything we know about Emily as a character, so that can't be it. Oh, and then literally seconds after saying that by working together they'll be able to get rid of Doyle, Emily hops off the subway, leaving Sebastian and Cia behind. Oy. Okay, the next afternoon the team is running down the cases - two families dead in two house fires on the same night! The husband and wife were suffocated and then their house blown up - a gas leak operating as an explanation for both unusual circumstances. The other case is a little more puzzling, as the police are assuming that the man killed his wife and child and then shot himself, since his own gun was used in the crime. 1 - Apparently all three were shot in the forehead. Who shoots himself in the forehead? Wouldn't you have to pull the trigger with your thumb? It has a silencer. I assume that Doyle's people killed this guy because of some involvement in espionage, but even if he was shady, would he really have a silencer lying around the house? And if he didn't have one, how could the killers have possibly have brought a silencer that would fit his gun? 3 - If he killed his family and then himself, how did the house get set on fire? Alright, back to the show - where it's revealed that I was hasty in my complaint! So you're saying he has to kill in the next 72 hours, or what happens? Wouldn't it actually be easier for him to kill during this storm? I mean, he murders whole families, and during an apocalyptic storm they're guaranteed to be home, and the police will be unable to respond to any calls. Yeah, that made less than no sense, Greg. 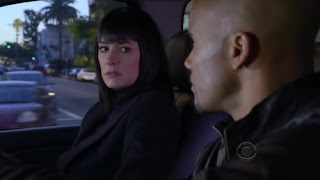 Garcia then confronts Emily about her constantly being late, assuming that she's finally found herself a fella. Emily shuts her down in a surprisingly brusque way, which I can only assume will make Garcia even more curious... after the opening credits! Emily and Joe head to the crime scene, where a phone call lets them know that the police won't be coming because of a 'mix-up' at Metro PD. Or, far more likely, this was a very expensive episode (four murderers in the hit-team so far! And Doyle might not actually be one of them, so that could be five villains! ), and they're cutting corners wherever they can. An inspection of the house reveals that it had unusually high security - steel doors, deadbolts in the bedroom, and a gun close by at all times. So who was he afraid of? Could it have been himself - he had a knowledge of his own violent tendencies, and provided a safe room for his wife and child? Garcia (back at the office) thinks no - there's no history of psychological or financial stress in either family. Garcia points out that since the families were killed at around 9PM, well before bedtime, there's a good chance that the killers specifically moved them to the bedrooms - which goes further to confirm their theory that these two cases are linked! The coroner completely shoots down the murder-suicide theory, since the father didn't have any smoke in his lungs, which he would have if he'd have started the fire before killing himself. I think the larger - more psychologically relevant - point is that there's no reason to start a fire to 'cover up' a murder suicide. There are bullets in everyone's heads. A house burning down isn't going to change that fact. More importantly, shouldn't they have dismissed the possibility when they noticed that the fire hadn't spread because the house had an advanced fire detection and sprinkler system - if someone who lived there had done it, they would have known about the sprinklers and not bothered with a fire. Only someone unfamiliar with the house would have made this mistake. Strange that they missed that one - it's exactly the kind of psychologically accurate but investigatively irrelevant conclusion they specialize in jumping to! Joe and Emily head back to the office, frustrated that they still haven't managed to connect the victims. Reid is even more frustrated - his migraines are a continuing issue, and are interfereing with his ability to focus on the case! It seems that he's seen a series of doctors, none of whom have been able to find a cause, and he's still completely unwilling to accept a psychological explanation. Reid is able to slink out of further discussion by coming up with a clue - a common number that both households dialed! This is another piece to the puzzle that Garcia is assembling, which is based largely around the fact that there has been no media coverage of this case whatsoever - the one web article linking the fires has even been pulled. Conspiracy? The number that connected the families belongs to a British man named Delaney - but they find out this information too late for it to be of use, since Doyle's men have already gone to his house and murdered him! Emily and Derek head for the house, wondering aloud about the contradictions in the killers' M.O. - why go to the trouble of covering up the murders and then just leaving the bodies lying around? Could they have wanted the profilers on the case? Nothing about these misgivings makes sense - there was no ritual aspect to the crime, and beyond the fire/attempted fire, no sign they were connected. The two sets of murders were actually done by different people. If they wanted FBI involvement, there's a million things they could have done to attract their attention, and the killers did none of them. Also, why did the cops bother bringing the FBI in on this - shouldn't they have established a pattern before asking for help? The autopsies hadn't even been done confirming that these were all murders, rather than an accident and a murder/suicide. Okay, back to the plot - where Emily and Derek have arrived at the latest victim's house just as the killers are finishing up with using a drug to give him a heart attack, Michael Clayton-style! The killers come out shooting (turns out Doyle was, in fact, one of them), and then flee for their waiting van, which is around the corner. It seems their plan involved parking around the corner from the house of the guy they were going to kill, walk to his house dressed all in black wearing creepy cherub masks and carrying assault weapons, then walk back to the van after the murder was complete, still all in the open, with the suspicious dress and guns. I'm beginning to understand why this guy was already in jail. 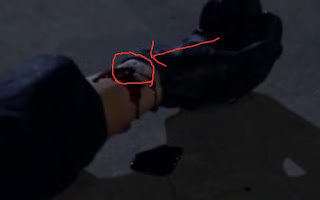 Emily manages to shoot one of the killers in the leg, and when it becomes clear that he's not going to make it to the van Doyle not only executes him, but pointedly shoots him in the wrist, destroying some kind of a tattoo. Which is just incredible marksmanship. That's obviously two leaves of a four-leaf clover, right? Or am I just assuming that because Doyle is an Irish goon who presumably prefers working with his countrymen? Emily and Derek consider the damaged tattoo, and see it as a likely suggestion that the guy's face and prints won't be in the system. Which seems like a bit of a stretch, really - if the guy was totally out of the system, what are the odds that a clover tattoo on his wrist cold be used to conclusively ID him? Even if it's some kind of an IRA-related thing, that's popular subject matter for poseurs. Derek and Joe look over the victim's body, discovering the injection mark, along with cash, a gun, and a passport suggesting that he was about to go on the run. He'd also tried to call the previous victims that morning, but didn't leave a message when they didn't answer. Given that one victim was German, another was Italian, and this one is British, Joe announces that whatever these three people were involved in, it can't have happened in America! This conclusion is based on nothing. DEAD GUY: (Dials phone) Hello, entire FBI? You know that guy you desperately want to catch? He's coming to get me, so maybe you could look into that? They explained that Emily isn't giving her compatriots a heads-up about Doyle because she's afraid he'll come for them and their families (which is, of course, nonsense) - this guy had better have a more compelling reason to leg it rather than call the authorities. The team is clear about its next priority: find out who warned the British guy that Doyle was coming! Also, try to figure out why, even though he got the warning that morning, he wasn't actually leaving town until 12 hours later, long after he'd have the protection of being hidden in a crowd. Garcia goes to do some investigating of her own, talking to the reporter who pulled his story about the fires. But why did he do it? He's extremely jittery at even being asked. She offers access to details on the case for a story later on if he helps them solve it now. His response? Follow the money! Meaning the paper he works for has some financial interest in the murders? Tracking down the ownership, Garcia uncovers that the paper is owned by an evil conglomerate who employs fake Blackwater to do all of its security! And all three victims worked for fake blackwater seven years earlier! Wait, what? Yesterday you told us that you were unable to find ANY connection between the two dead families, beyond one member of each being European. Now you're telling me that they had identical employment histories? How on earth did you miss that? Also, the evil conglomerate explains why that blogger had his story pulled - it doesn't explain why every other newspaper didn't cover the story, which was supposedly the really strange part. Any line on that plot point? 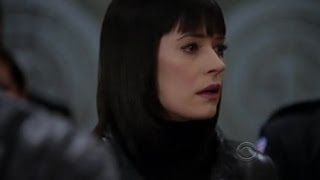 Reid has figured out the tattoo, and when Emily realizes what it is she goes pale and runs for the bathroom to call Cia - this is noticed by Garcia, who follows her and interrupts the call. Here's the thing, though - how is this a surprise to Emily? Since last night they've been operating under the theory that some sort of European hit squad is in Washington to settle scores. Emily knows that a European murderer (who claims to have guys backing him up) is in town to settle scores. How is it only just now that she's connecting those two facts? Emily once again refuses to let Garcia in on the secret, hurting her feelings in the process. How does she get Garcia to climb off her back? By telling her about a recurring dream she's having! Which would totally explain why she freaked out when she saw the drawing of a four-leaf clover! Rachel then runs in to tell them that Greg needs to talk to everyone in a secret conference room. This is the first time that I noticed that Rachel was in the episode. To this episode's timeline? How long were Emily and Garcia in that bathroom? Because we saw the team find out about fake blackwater, then seconds later Reid revealed the tattoo, and Emily ran off. Then Rachel popped in to say that the head of fake blackwater is in the secret conference room. Was he coincidentally already in the building? Okay, back to the plot. Once Greg threatens them with publicity fake blackwater president offers to help, and the team lays out the profile of the murderers they're looking for - highly-trained military, European, at least one Irish member. They also conclude that the leader must have a personal grudge, because they killed a child when they didn't have to. This, as usual, is based on nothing. Maybe they weren't planning on killing the child but he saw their faces or heard something that could be used to identify them? Henry Fonda didn't have anything personal against that family at the beginning of Once Upon a Time in the West, did he? Another key piece of evidence is the tattoo - the V on the bottom suggests a special splinter group of the IRA that calls itself Valhalla! Two points here - A: The stem is the part that got shot, so they couldn't know that. 2: How could a guy be part an extra-violent splinter group of the IRA without his prints or face being in any database anywhere? At no point during the scene does Emily pipe up to mention that she already knows who the killers are. Despite this, the fake blackwater president is able to name-drop Doyle, and they're off to the races! Here's the puzzling thing - Emily still doesn't mention her knowledge of the case (or why Doyle is here) to her team. Why? I can't tell you! While the rest of the team struggles to figure out who his next target is, Emily keeps quiet, offering only to check with her old friends from when she worked at Interpol. Okay, I'll stop claiming about this for a bit after this last one, but I've got to ask - what were the writers thinking? Up until now the only reason we've been presented with for Emily keeping quiet about Doyle is because if the FBI got involved in hunting him, he would go after her team. But the FBI is now hunting him. She can no longer claim to be keeping her team safe by keeping them in the dark - in fact, she's putting them in greater danger by letting them go after Doyle without her insight into his character, or the knowledge that Doyle knows who they are (AND WHERE THEIR FAMILIES LIVE), and that they're probably now targets of his vendetta. God, she'd better turn out to be a war criminal or something. Otherwise she's just a terrible person. 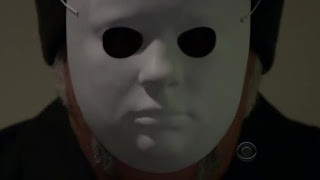 Since Emily's not helping, they decide to head to the latest victim's house, hoping that as a spymaster he would have had some files on Doyle that they can scour for clues. Emily and Derek drive over, and on the way she gets a call back from Cia and Sebastian - she has to play it cool because she doesn't want Derek to know about her compatriots, but this scene actually hammers home the point that she knows her team is in danger and she's pointedly not warning them about it, or using any resources to protect them. Instead, she just asks S&C to look into the victims, and how they connect to Doyle. Come on, guys - there are four palm trees in that shot. You're not even trying. Searching the house Emily and Derek come up with a file, which they bring back to the office. It features a photograph of the fake blackwater team seven years earlier, hanging out in North Korea. The immediate conclusion? That they turned Doyle over to the North Koreans to be put in a political prison? Um... why? More importantly, why does no one ask why? This is an American mercenary company capturing a European fugitive in Italy and taking him to a country that speaks to no western powers for any reason? How would they manage that? Why would they want to? Emily is equally surprised about this turn of events, and calls Sebastian to ask him about it. He says that while he knew about the Korean situation, he didn't tell anyone because it was need-to-know. During this entire conversation no one explains why you'd send him to North Korea, so I'm still in the dark. Angus' character is name-checked though, so while he's disappeared from the narrative, at least people remember he exists. Sebastian's secrecy convinces Emily that he must be involved somehow, and she asks to talk to Cia privately. She tells Cia to escape by going to a forger they know in the hopes of getting good papers to make a getaway. I don't know why she'd need papers to do that. Couldn't she just drive to upstate New York and check into a bed-and-breakfast that takes cash until Doyle has been caught? Can't get more off the grid than that, can you? Emily's got her own ticking clock to worry about - while she tries to track down Doyle, the team is looking into everyone who was at Doyle's villa the day he was arrested. They hope to both find someone who can help them with Doyle and warn any other possible victims. Emily is dreading what will happen when they discover she's on that list. The show has utterly failed to explain why she feels this way. It seems that Cia did come through with bank accounts that the victims had, and sends them to Emily. This may allow them to find other people who received payments for the same sources. Good job, Cia! Which makes it all the sadder that Cia is killed off in the very next scene. She goes to see Emily's forger, and Doyle shoots her through the door. This raises a couple of interesting questions - is Sebastian evil? If so, how did he know where she was going since he wasn't in on that part of the conversation? Even if Doyle was tipped off by Sebastian, how could he have gotten to the forger before Cia did? Did he know about the forger some other way, and he's just been hanging out there for days, hoping that someone he wanted to kill would turn up? All questions that the producers of Criminal Minds hope we won't ask! Back at the office, a huge multi-agency taskforce has gathered to start looking for Doyle. Emily is doubtful that they'll find him. After all, he got into the county with no trouble, why would he have difficulty escaping the district? Um, well, let's see... he got into the country by using falsified papers to charter a plane while (for nebulous reasons) no one was looking too hard for him. Now he's the most wanted man in America, brutally murdering families and shooting assault weapons at federal agents in the middle of Georgetown. Does she honestly not undestand why he's going to have a much harder time escaping now? Derek enters, revealing that the cops are onto the murder of the forger, so he and Emily head over to the apartment to check it out. 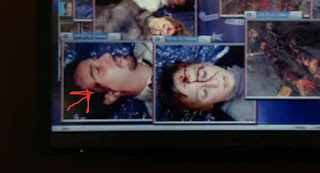 Derek sees two shots in the check of the forger, and then Cia, who was shot in the forehead through the door. His conclusion? This must be the work of their guy! Why is that, Derek? Because it in no way matches the MO of any of the earlier killings? Brilliant deduction, my good sir? Oh, and Doyle's planning to escape the city by... driving away! In a car! With another scraggly Irish guy! Yeah, that's not going to draw any queer looks at the roadblocks. Emily is so traumatized by seeing her dead friend that she vomits on her shoes, then convinces Derek to take her back to her apartment so that she can change. Doyle is watching from across the street, and his friend suggests just killing her now, but Doyle first wants to hear her 'confess', which again points to her somehow being responsible for the death of his child, her guilt over which in no way explaining her risking the lives of all of her closest friends. In the previous scene when it was announced that Doyle was leaving in a car, it was kind of nebulous where they were exactly, so I could have accepted the suggestion that after killing Cia he bugged out of the city, and was already in Virginia when that scene took place. But this scene establishes that he's still inside DC post-roadblocks going up. How could he possibly escape? Back in her apartment Emily changes clothes, then goes to her safe and takes out a gold ring on a chain, which she flushes down the toilet - a gift from Doyle, we assume? Then it's profile time, with Greg addressing the assembled task force members. The speech is a bit of a mish-mash of nonsense, announcing that they'll catch him the way they catch everyone, by analyzing his behaviour! Of course, that's not how you catch almost anyone, but let's move on to the second part, where he explains that Doyle escaped North Korea by killing a guy, stealing his car, and driving into Russia. 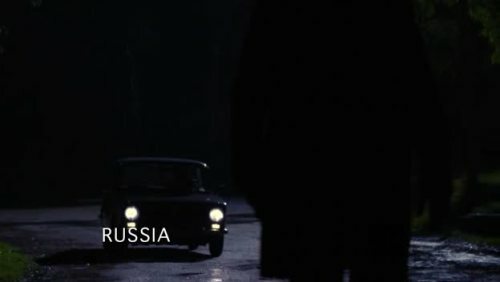 Where we saw him kill a Russian guy in Russia and steal his car. 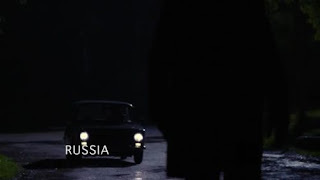 More importantly, though, even with a stolen car, how did he get from North Korea into Russia? That's not an unguarded border, is it? I have no idea why this change was made - is Criminal Minds popular in Russia, and they didn't want to offend anyone by suggesting that they had secret political prisons where fake blackwater could have dumped Doyle? While Greg speaks, Emily looks over all her friends, thinking about what a terrible person she is for putting them all in danger for no reason. Yes, you should cry. You're horrible. No crimes solved yet this week, so we're not going to be judging at this moment. But no, not a lot of psychology, except for the 'personal connection' guess, which wasn't actually relevant the way the tattoo was. They connected all three victims, then asked their mutual boss who might want them dead. Even with Emily stonewalling, completely conventional police techniques saved the day! Holding off on this until next week. Next week being the week where Emily better have a damn good reason for not getting her team to help out. She can't even claim it's some kind of loyalty to her team, since Cia's dead, Angus is MIA, and she thinks Sebastian is evil, although without any real proof for that latter assumption. Also, the show had better have a damned good explanation for how Doyle escaped the dragnet keeping him in DC. He's the most-wanted man in America, are we really supposed to believe he could just drive out? Hey, I just realized something - how did Doyle find out who the blackwater employees were who took him to North Korea? He's only been out of a political prison for like five weeks - is this easy information to track down when you're an internationally wanted fugitive? Are they going to reveal that blackwater president is evil? Isn't it a bit of a stretch that three of the people involved in moving Doyle all just happened to live very close to the main focus of his revenge? You've got some 'splainin' to do next week, show. Frank: "Now that you’ve called me by name …"